The REACH program’s ability to obtain approvals for 93% of patients is slightly higher than the approval rates published in previous studies, which have ranged from 81% to 91%. The Respectful & Equitable Access to Comprehensive Healthcare (REACH) program obtained 93% of prior authorization (PA) approvals for hepatitis C medications, which suggests that experienced patient navigators working in collaboration with a nurse and a specialty pharmacy can be an alternative model for obtaining PA approvals, according to a study published in the Journal of Managed Care and Specialty Pharmacy. Trang M. Vu, MD, from the Division of General Internal Medicine at the Icahn School of Medicine at Mount Sinai in New York City, and colleagues, conducted a review of program databases and medical records of patients for whom DAA hepatitis C medications were ordered between November 1, 2014, and October 31, 2015. Patients were followed for 180 days or until PA approval was obtained. The researchers then examined the relationship between patient clinical characteristics and (a) the number of steps in the PA process and (b) the time to medication approval. Demographic and clinical data collected included age, gender, race/ethnicity, insurance, HCV genotype, liver fibrosis staging by Fibrosis-4 (FIB-4) score, psychiatric history, history of HCV treatment, DAA regimen prescribed, date PA was sent to specialty pharmacy, date internal appeal was initiated after first adverse determination, date external appeal was initiated after final determination from insurance, and date medication approval was received. Information was also gathered on the date the prescription was sent to patient assistance programs of pharmaceutical companies to cover medications for uninsured patients or patients whose insurance would not cover DAA therapy. The primary outcome was an ordinal variable representing the number of steps in the medication approval process required to obtain PA approval; the secondary outcome measure was the time needed to obtain medication approval in days. Patients (n=197) were insured by Medicaid (69%, n=136), Medicare (12%, n=24), both Medicaid/Medicare (10%, n=19), or private insurance (5%, n=10) or were uninsured (4%, n=9). 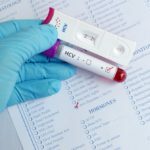 Ninety-three percent of the patients were eventually approved for HCV treatment. The steps in the PA cascade were approval on first submission (37%; mean days = 30.7; SD = 29.9); approval after internal appeal (45%; mean days = 66.8; SD = 70.5); approval after external appeal (11%; mean days = 124.7; SD = 60.2); and no approval obtained (7%). Unadjusted factors found to have fewer steps in the PA cascade were older age, female gender, non-Medicaid insurance, comorbid hypertension, comorbid diabetes, being domiciled, and being nongenotype. After adjustment, non-Medicaid insurance and nongenotype 2 remained significant. In survival analysis, non-Medicaid insurance and mid-range fibrosis were associated with fewer days to PA approval.